The study of Scripture must be more than a religious routine. hen I attended church camp as a young teen one summer, our cabin leaders were two young guys who were not saved. Sad, but true. On the Tuesday night of camp, they even snuck out of our room late to meet some young women. Even as a 14-year-old, I sensed their theology was warped. In our churches, we rightly tell new converts (and old converts) to read the Bible. However, we are not as good at teaching people how to read the Bible, which can lead to problems like the one demonstrated in my camp cabin many years ago. Let’s look at ways we should (and should not) read the Bible. “All scripture is given by inspiration of God” (2 Timothy 3:16), so we can read the Bible with confidence. Literally, inspiration means the Bible is “God-breathed”—God inspired select men to write the narratives, letters, poetry, prophecies, Gospels, and other writings we find in its pages. “By this process of in-breathing or inspiration, the divine mind was impressed upon the human mind so that what was written by man was written of God,” wrote Charles W. Conn. “The Holy Spirit guided and directed the writing of the Scriptures, using words from the writers’ own vocabularies and utilizing their individual styles” (The Bible: Book of Books). The apostle Peter wrote, “No prophecy in Scripture ever came from the prophet’s own understanding, or from human initiative. No, those prophets were moved by the Holy Spirit, and they spoke from God” (2 Peter 1:20-21 NLT). In my office, I have a small plastic container that once belonged to my mom. It is engraved with the words “God’s Gifts.” This container holds 150 cards, each with a Scripture verse printed on one side and a brief prayer on the back. For instance, one card says, “The Lord shall open unto thee his good treasure” (Deuteronomy 28:12). Another one says, “God is with thee in all that thou doest” (Genesis 21:22). Reading those verses alone, outside the context in which they were written, could cause me to erroneously think, God wants to make me rich; and, Whatever I choose to do, God will be in the middle of it. However, if I also read the verses surrounding those two scriptures, my thinking is corrected. In Deuteronomy 28:12, I discover God was promising to bless Israel with rain and good crops (treasure to them) if they lived in obedience to Him. And I see that Genesis 21:22 depicts two men telling Abraham, “God is with you” before they enter an agreement with him. Repeatedly, the Bible refers to itself as something to “eat.” Just as our bodies need physical food every day, so our spirits needs daily sustenance. The prophet Jeremiah said to the Lord, “Your words were found, and I ate them, and Your word was to me the joy and rejoicing of my heart; for I am called by Your name, O Lord God of hosts” (Jeremiah 15:16 NKJV). Some portions of God’s Word are “sweeter than honey” to our mouth (Psalm 119:103). They are delicious and nutritious, encouraging us in our walk with God. Other portions of Scripture are meatier (Hebrews 5:14), enabling us to grow in our knowledge of God and His ways, and thereby draw closer to Him. Jesus said, “Man shall not live by bread alone, but by every word that proceeds from the mouth of God” (Matthew 4:4 NKJV). Just as we need to find time to eat and drink food every day (and we do), we must make the reading of God’s Word part of our daily schedule. Jesus once told a group of religious leaders, “You search the Scriptures because you think they give you eternal life. But the Scriptures point to me! Yet you refuse to come to me to receive this life” (John 5:39-40 NLT). 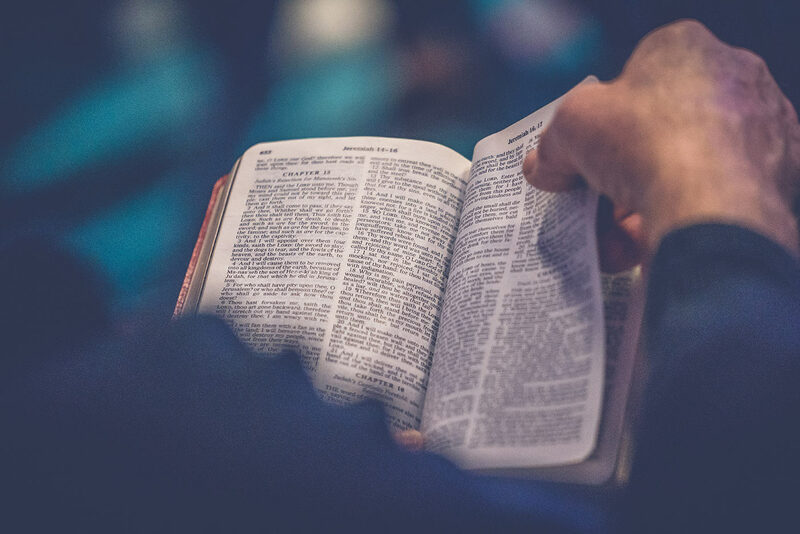 The Bible’s overarching story is about the need for a Savior; prophecies concerning the Savior; the Savior’s earthly life, death, and resurrection; the Savior building the Church; and the Savior’s future return. Yet, nearly all of the Old Testament experts of Jesus’ day refused to believe He was the promised Savior living among them! For those leaders, the study of Scripture had become a religious exercise . . . and the same thing can happen to us. Some people today can list the names and backgrounds of Jesus’ dozen disciples . . . yet they are not growing as disciples of the Lord. Others can list the details of Paul’s three missionary journeys . . . yet they are not motivated to help fulfill the Great Commission. Some can explain the monetary terms of the Bible—shekel, talent, mina, drachma—yet they are stingy in their giving to God. As we read the Bible, we must not get so bogged down in Biblical names, numbers, and places that we overlook the heart of the Scriptures, which John summed up at the end of his Gospel: “And truly Jesus did many other signs in the presence of His disciples, which are not written in this book; but these are written that you may believe that Jesus is the Christ, the Son of God, and that believing you may have life in His name” (20:30-31 NKJV). While I have done a read-through-the-Bible-in-a-year program in the past, I have found my Bible reading is more meaningful if I read reflectively instead of trying to reach a predetermined quota every day. Some days I read one chapter; other days, three or four. After I read a chapter, I will typically read it again, meditate on it, and mark any verses that stand out to me. Once I’ve finished reading, I will incorporate what I’ve read into my prayers. Job prioritized interceding for his 10 children, and I must be faithful in praying for my two children and three grandkids (Job 1:5). I can expect tests and trials to come my way, but God is always in control (1:12). When a friend is crying out in pain and suffering, I must not be a “miserable comforter” by criticizing him or her (16:2). I must minister to orphans and widows (24:3-11; 29:11-13). Jesus repeatedly told His disciples that He would be crucified and resurrected, but they never grasped what He was teaching them until after His resurrection. Just before He ascended back to heaven, Jesus “opened their understanding, that they might understand the Scriptures” (Luke 24:45 NKJV). You might think, I wish Jesus would appear to me during my devotional time and open my understanding. Here’s the good news—after His ascension, Jesus sent the Holy Spirit to be your Teacher. As Jesus promised the Twelve, the Holy Spirit “shall teach you all things” (John 14:26). The same Holy Spirit who inspired the writers of Scripture will teach you if you will diligently apply yourself to studying God’s Word. He will “guide you into all truth” (John 16:13).